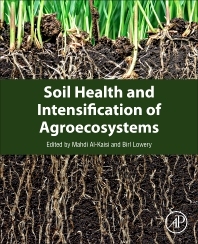 Soil Health and Intensification of Agroecosystems examines the climate, environmental, and human effects on agroecosystems and how the existing paradigms must be revised in order to establish sustainable production. The increased demand for food and fuel exerts tremendous stress on all aspects of natural resources and the environment to satisfy an ever increasing world population, which includes the use of agriculture products for energy and other uses in addition to human and animal food. The book presents options for ecological systems that mimic the natural diversity of the ecosystem and can have significant effect as the world faces a rapidly changing and volatile climate. The book explores the introduction of sustainable agroecosystems that promote biodiversity, sustain soil health, and enhance food production as ways to help mitigate some of these adverse effects. New agroecosystems will help define a resilient system that can potentially absorb some of the extreme shifts in climate. Changing the existing cropping system paradigm to utilize natural system attributes by promoting biodiversity within production agricultural systems, such as the integration of polycultures, will also enhance ecological resiliency and will likely increase carbon sequestration. 3.3 Can SOC Depleted from Dryland Soils be Restored? Dr. Mahdi M. Al-Kaisi is a professor of Soil Physics at Iowa State University, Ames, Iowa, USA. He obtained his B.S. degree in Soil Science from the University of Baghdad, Iraq, in 1974, and M.S. and Ph.D. in Soil Physics from North Dakota State University in 1983 and 1986. Professor Al-Kaisi held positions as a Water Quality Specialist at Colorado State University, 1990-2000 and Assistant, Associate, and full Professor from 2000 to present at Iowa State University, where his research focus is in the area of applied soil physics that includes research on the effects of cropping and tillage systems, crop residue management, and nitrogen application on soil physical properties, soil carbon dynamics, greenhouse gas emissions, soil temperature, water quality, and other ecosystem services. Professor Al-Kaisi and his graduate students, along with colleagues, published research findings in a wide range of national and international journals, proceedings, and popular press. His research led to the development of extension bulletins, and online management tools such as, residue and erosion calculators and the development of a soil carbon index for soils in Iowa. He served as Associate Editor for many journals and review panels. Professor Al-Kaisi is a Fellow of the American Society of Agronomy, USA. Birl Lowery is an Emeritus Professor of Soil Physics at the University of Wisconsin-Madison (UW-Madison). He held positions ranging from Assistant Professor to Professor from 1980 to 2014 at UW-Madison, and Senior Associate Dean in the College of Agricultural and Life Sciences from 2010 to 2013. In 1973 he obtained a B.S. degree in Agricultural Education from Alcorn University, an M.A. degree in Agricultural Engineering in 1975 from Mississippi State University, and Ph.D. in Soil Physics in 1980 from Oregon State University. His area of research was applied soil physics, which included research on soil temperature and water regimes, erosion, compaction, contaminant flow in soil, and groundwater quality. He and his students and colleagues published their research findings extensively in a wide range of journals, proceedings, popular press, and book chapters. He has served as Associate Editor for numerous journals over his career.